I assume this is something that people already know about me, but I am a combination of a crazy cat lady and a crazy bunny lady. I have lots of cats and two rabbits, and the only reason I don’t have more is because I’m allergic to the hay and it makes me sad. Dogs are wonderful animals, very loyal and fun, but definitely more work than cats and rabbits. But in spite of my crazy-cat/rabbit-lady-ness, I love all animals (even the terrifying ones), and have a variety of pets besides cats and rabbits. One of those pets is a snake. A snake who, at the moment, is not trained to eat already-dead mice. Its name is Shesha, and Shesha likes ’em lively. 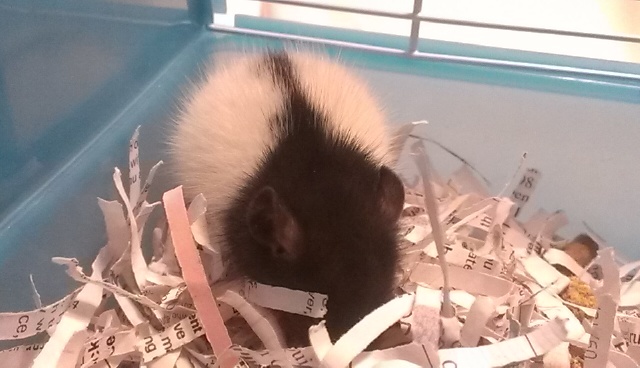 So while my mom was out’n’about the other day, I requested that she bring me a baby rat for Shesha. It’s big enough to eat an adult mouse, but mice can be aggressive and I don’t want my snake to get hurt or have to thump an animal on the head. I go for plump little rat fuzzies. However, when my mom went to our local reptile supply store, they didn’t have any little pups. 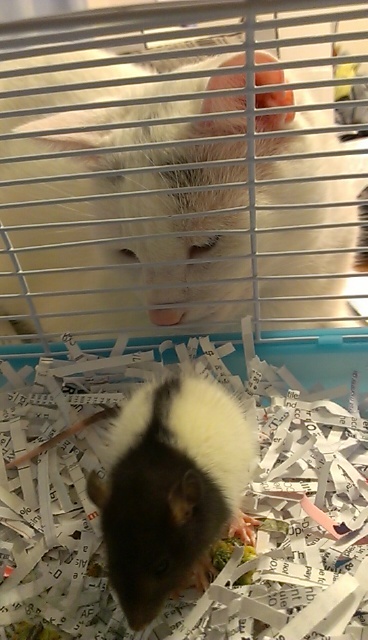 She got the next best thing, the smallest baby rat they had. 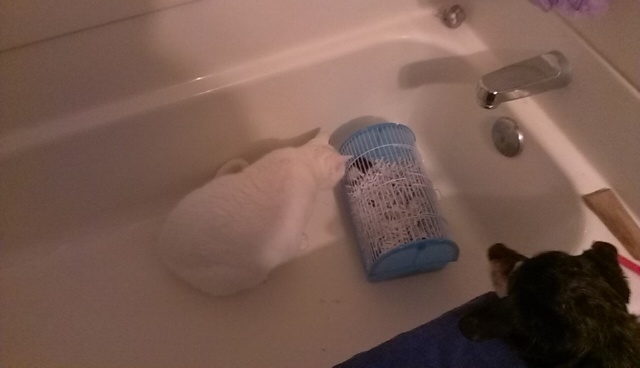 She put it in the bathroom to keep the aforementioned cats away and made me feed the rat to the snake. However, when I opened the bag, the rat was a bit too big for Shesha. No big deal, I figured, I’ll just exchange it tomorrow. 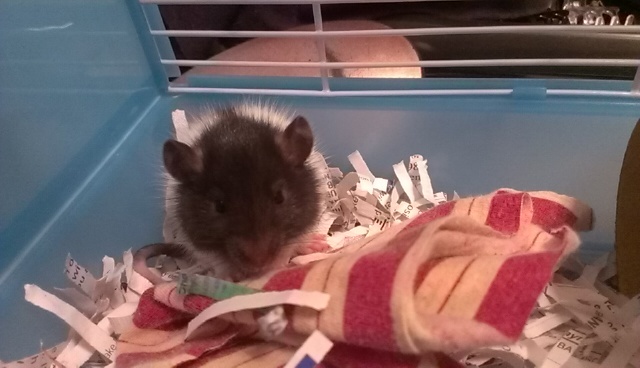 I rooted around for an old cage to hold the rat in overnight. While searching, the rat crawled out of the bag and into my hand. My heart went “thump-thump” and I cuddled it and played with it and cooed at it. It was so little, and so flippin’ cute! After playing with some names, the Accidental Rat’s name is Munchy, with the nickname Ratatat. It is awesomely cute, and tiny, and playful, and friendly, and cuddly. I love it. Not sure if it’s a boy or girl yet. 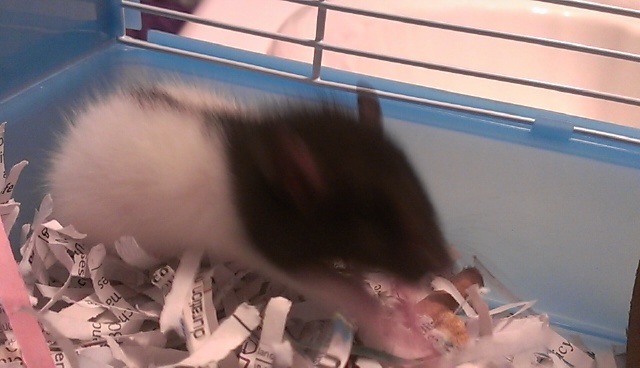 And that’s the story of how I accidentally got a pet rat this week. P.S. – the next day, I went and bought a smaller rat pup and fed it to the snake. Cycle of life continues. 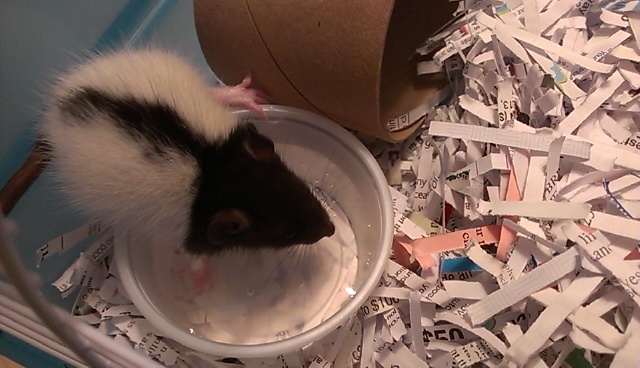 This entry was posted in Little Adventures and tagged cute, funny, humor, pets, rats, story, Writing. Bookmark the permalink. Until one has loved an animal, a part of one’s soul remains un-awakened. Great post!